Starvation - works well on geographically isolated castles and castles which can be easily surrounded. Similar to denial of the water supply. Difficult when access can be made along a wide river or by approaching from the sea. Mining - some of the most stubborn castles were breached by tunnelling under the walls and starting fires which would lead to a collapse of the supporting earth. Interestingly this was still a valid means of attack in the 1st world war along the Western Front. Treachery, surprise and stupidity - Chateau Gaillard was breached through an unguarded chapel window and Beziers fell when the defenders rushed out enthusiastically leaving the gate undefended. The other means of castle attack tended to involve machines, either stone throwing like a trebuchet or a battering ram. Read about the world's largest trebuchet at Warwick Castle. Location - perched high on a hill with limited and difficult access; surrounded by wet ground to make access difficult and mining impossible; built on the coast or around a large river to provide easy access as well as an escape route. Shape - a circular castle provided no corners for miners to expose; overhanging circular towers provided clear lines of sight for the archers; concentric castles with many walls made access progressively more difficult; skirts around the base of the castle walls denied battering rams a flat surface as well as providing a slope for the defenders to drop boulders on to so that they would then bounce along the ground and under the cover of advancing battering rams. The weakest point was often the castle gateway. This led to the design of drawbridges as well as angled entrances and the use of the barbican as a means to restrict access and provide a killing ground where attackers could be controlled and then massacred. Any castle building campaign was designed both to defend a country and to dominate the population. 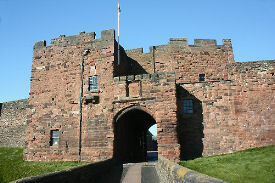 Often the castles would be situated to split an attacking force, ideally keeping the invaders busy until relief arrived. With infantry being able to travel up to 30 miles in a day and horsemen much further, a castle could control a wide area of countryside. Often a town would grow around remote castles and eventually the two would become consolidated together. 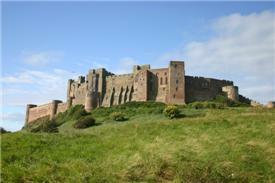 Other castles were built alongside existing towns or on a key geographical location such as near by a good harbour. To learn more check out the selection of books on medieval castles that we have in our online store (in association with Amazon).